A course, live workshop, and endless hours of Googling give you information. But they can’t give you personalized one-on-one ATTENTION and ACCOUNTABILITY from a former workaholic who has experienced your IDENTICAL challenges and succeeded in shifting from burnout to balance and passion to profit. I've charted my own career path by designing my full-time role and then transitioning to entrepreneurship. This 3-month tailored coaching package helps you define, develop and launch your first product or service to monetize your community. 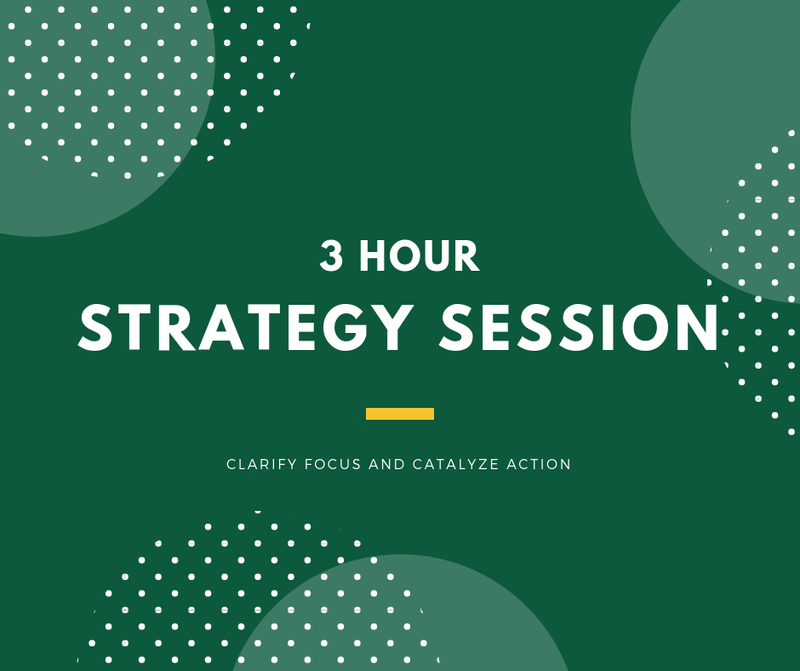 This three hour session walks you through a tailored process to identify opportunities for monetization that aligns with your goals and values. YOU THINK THAT'S OUT OF REACH? You've invested time, money and sweat equity and your ambition is at an all-time high but it doesn’t seem to pay off. You know there has to be more than this grind but you don’t know how to get it. I know because I have been there. You scour business blogs, books and podcasts only to emerge even more confused. You wonder how you can feel so stuck when you know so much. You’re lost figuring out this massive problem all alone. Because you’re feeling overworked and drained by your job, you can’t stick to an effective action plan. You’re relying on your old standbys workaholism and perfectionism to feel in control. You think if you keep on pressing that things have have to get better. You need the structure and accountability to take immediate action. You need the right habits and systems to accelerate your path to greater freedom with your time and higher income. You want a step-by-step plan tailored to your needs and goals. You're stuck or overwhelmed. You know that you want to move forward but you also feel boxed into your status quo. You’ve got a million ideas or tactics but no clue about which one is best. You need clarity and direction to move forward. You desperately want a step-by-step plan, straightforward advice and accountability from someone who gets you, your vision and has made this entrepreneurial journey before. I take on a limited number of new 1:1 clients each month. Want to be one of them? Complete the application below and I will be in touch within 48 hours for a discovery call to see if this is a good fit for your needs at this time. This session will walk you through creating a business plan with clear revenue goals that aligns with your values. We review all aspects of your business, identify your most important and pressing operational needs and co-create a plan with you to catalyze your growth. Schedule your call using the button below. You will receive an email confirmation along with the pre-call questionnaire. Complete the pre-call questionnaire so I can come prepare to deliver solutions. Come to the session with any additional questions you may have outside of your responses to the pre-call questionnaire. I will send the workbook right before our scheduled session so you can gather any supporting materials. You will receive limited additional email support for implementing your action plan.